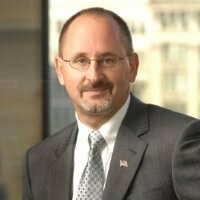 Gary R. Stockbridge is president of Delmarva Power, and chair of the Vision Coalition Leadership Team. He has more than 20 years of utility experience, with an emphasis on enhancing customer service. Most recently he served as vice president of customer relations. His experience includes development of processes for the introduction of retail choice, improving billing system performance, and enhancing communication to customers. Stockbridge has a strong commitment to the local Delaware community. He is the board President for Kingswood Community Center in Wilmington, and is active as a teacher and board member for Junior Achievement. Stockbridge is also a member of the governor’s Energy Advisory Board and is chairman of Delaware’s Workforce Investment Board. Stockbridge received his undergraduate degree in engineering and a Master of Business Administration degree in finance, both from Drexel University. He serves as chairman of the board of directors for the United Way of Delaware.